Ayes To The Left: Has Andy Coulson Just Fired The First Salvo? If So, Who For? Has Andy Coulson Just Fired The First Salvo? If So, Who For? These days Westminster talk is not about how much judgement David Cameron has, it's whether he possesses any at all. so, I am puzzled to learn today (at a time when yet again David Cameron's judgement is being questioned over leaving the country in the aftermath of a terrorist attack) that Andy Coulson has popped up and has penned a 10-point "master plan" in GQ magazine, supposedly to help his former boss "rescue" his premiership, using the PM's number one enemy and contender for his job, London Mayor, Boris Johnson! I cannot help but wonder if one of those points in Coulson's "rescue plan" should be not to hire ex newspaper editors with dubious reputations as spin doctors and to steer clear of women with red hair who borrow ex Metropolitan police horses for the PM to ride and who 'used' to work for Australian tabloid newspaper tycoons and who send you intimate texts on the eve of important speeches and then blurt out the content in an Inquiry? Both Coulson and Brooks are due to stand trial in September charged with several serious offences concerning phone hacking, perverting the course of justice, and paying police for information etc which if found guilty could lead to custodial sentences for both of them. Reading the article about Coulson in the Independent today, one wonders why Coulson has chosen this time in particular to openly publish such advice, why not just quietly send it directly to Cameron? Which leads me to wonder if it has been written to help or hinder his former boss? On the face of it, the article is pretty lame and appears to offer some banal advice that quite frankly looks to have been jotted down in five minutes on the back of a fag packet, but what I find intriguing is what may be "hostile under-current" fizzing away between the lines and why publish it for all (including the opposition) to read? 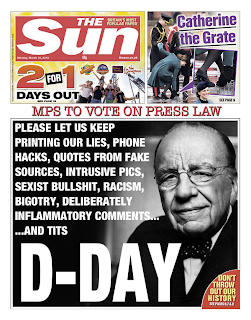 It cannot help David Cameron to have the public reminded of Andy Coulson, Rebekah Brooks, Rupert Murdoch and the now defunct Sunday newspaper the News of the World at this particular time, and the potential for lasting damage that this could do to Cameron should not be underestimated. Are "all roads are leading back to the Leveson Inquiry"? Cameron who has been paralysed with indecision over how to implement the Leveson recommendations for press regulation eventually decided to back the Royal Charter thrashed out between all the political parties, only to find himself at odds with the right wing press, this in turn led the press to form their own charter which Cameron has said he will not back. Is it possible that Andy Coulson who quite possibly is bristling with hostility at losing his job, his motivation, his friends, connections in the newsprint industry etc has been used to fire the first round for the press, or is it something else? Incidentally it is no secret that Rupert Murdoch is a fan and advocate of London Mayor Boris Johnson and their "friendship" goes back and reveals some "dirty little secret meetings" and again more recently and Boris Johnson planned to build a Rupert Murdoch Academy all of which the right wing press largely and conveniently tend to ignore! Andy Coulson could be feeling cut adrift and ostracised from someone he thought of a friend. I have pointed to this before and written how I thought this could spell danger for David Cameron at some point, it now appears we may be nearing this point! Purely from a business angle Coulson's earning potential has plummeted since he was forced to resign as the prime minister's Director of Communications. With his court case now looming, just 4 months away, if he is found guilty Coulson in all probability will be sent to prison, he has a family to keep and mortgage to pay and unless he is receiving income from "elsewhere" we do not know about then somehow he has to provide for his family should the worse happen. I wonder if this is also behind his decision to suddenly break his silence after two years? If it is, it is hard to think of a more damaging way to do it for the PM than to put his arch rival firmly in the frame for the top job, taking care at the same time to subliminally damage David Cameron by furthering the opinion that his premiership is in serious trouble (hence the "rescue plan") and bolster the reputation of Johnson by announcing it's not Johnson's style to stab people in the back! Was this a direct pop at Cameron because Andy Coulson feels like he has been stabbed in the back by David Cameron? Pressurising Andy Coulson to resign, getting rid of the Essex boy and filling his shoes with the PM's old Etonian pals and Lynton Crosby must feel like a dagger through the heart! And Coulson talking about "utilising Samantha Cameron" as if she is some kind of female chattel at a time when the PM is under fire for leaving the UK to go on holiday so soon after a terrorist attack and for allowing himself to be pictured posing with his wife in sunny Ibiza while staying in a luxurious villa while the rest of the country suffer's austerity in the cold in the UK and the grief of the family of a horrifically murdered soldier is laid bare in just about every newspaper, is a particularly vicious swipe at David Cameron! It shows that whatever happens to us in this country, this PM, and this government only care about winning elections and gaining advantageous publicity. It will gel in people's subconsciousness and it will do absolutely nothing to gain back the PM's lost female votes! Coulson writes that Boris Johnson "would much rather see the PM fail miserably in the election", I bet he would and Boris Johnson is not the only one who wants to see Cameron fail miserably, so does (in my opinion) Andy Coulson, or why write such an inflammatory comment which as a former newspaper editor Coulson will be perfectly aware of how it will be taken and used against the PM! Although Coulson's intervention in the form of his "masterplan" is being touted in a way to assist his former boss, if you believe that you will believe anything. What Coulson has done at a particularly damaging time is reveal that David Cameron is still having private conversations with someone awaiting trial for extremely serious allegations, as well as presiding over a hopelessly split party where not only are MPs knives out for Cameron, so are the knives of his former "friends" and so-called advisers and and even big Tory financial backers! This is a seriously covert attack on Cameron and his premiership! The Independent said "this should give a boost to No.10", it is hard to see how, this is yet another punch in Cameron's political solar plexus! This is a "masterplan" alright, only it is a masterplan designed to smile at David Cameron while taking one of those long political knives and stabbing him firmly in the back! Coulson's return to journalism now, is not just coincidental, it is planned and could prompt even more damaging revelations ahead of his court case. With Ukip on the ascent and robbing Tories of their ultra right wing voters and David Cameron's reputation as competent and truthful plummeting to new depths, it is hard to imagine a more damaging time for the tainted and politically poison Andy Coulson, himself awaiting trial for serious offences to be writing about how he wants to "help" the prime minister! This so-called "masterplan" is a clear warning to David Cameron about what Andy Coulson knows and the trouble he can cause, reminding the PM about just how close they once were and it's Andy Coulson highlighting David Cameron as a failing PM! It is a shot across David Cameron's bows for sure, the only thing I cannot work out is if Andy Coulson has just fired the first salvo for the Murdoch press, Boris Johnson or himself? Andy Coulson, Rupert Murdoch the right wing press and Boris Johnson and Nigel Farage and Ukip all seem inexplicably linked at this time, can "Deckchair Dave" do anything to stop the impending explosion? Cameron should be careful, Coulson is a wolf in sheep's clothing! What Cameron and Osborne's Tories really Think of Us! What's the True Extent of Cameron's Involvement with Murdoch, Brooks and Coulson? Er, Yes, No or Maybe Prime Minister? How is the alleged perjury claim in relation to the Tommy Sheridan trial proceeding? Rob, the waters between the two are certainly muddied, however, I don't think one can influence the other, for a start Scottish law is different to English. We were Warned in 2010 The Tories Would Cause Chaos & Devastation, It's Coming True! Both Cable & Clegg Signed Up To Abolish Tuition Fees then TREBLED Them & Vince Calls Corbyn Out?!!! Tory "Donorgate" - A Comprehensive List! Is The British Conservative Party "Institutionally Racist"? Who Reports on the Reporters and who is Rowena Mason? Philip Davies Tory MP's Blatant Hypocrisy In Reporting Denis MacShane! Lunatics Have Taken Over The Guardian! How Dumb Is This Coalition? When Is The Irish Government Going To Learn? Do you feel the same way I do about the kind of Britain you want to live in? A free NHS based on need and not the ability to pay? A brighter future where you feel safe and secure and do not fear your own government or what they will do to you next? Is Mervyn King In La La Land? This is the Country Cameron Created! The Battle of the "Swivel-Eyed Loons"! The British Government Is a Total Omnishambles! Dave and George "The Two Wrongies"
Cameron Has Let Ukip Genie Out Of The Bottle!